On Sunday the Southbank saw a variety of decorated bikes parade along with a marching band. The event (previously highlighted on this website) attracted cyclists and bicycles of different styles, it was part of the commemoration of the 1951 Festival of Britain when a floral bicycle parade took place in Haringey. Decorate and bring your beautiful bike along to the Southbank for a Floral Bicycle Parade! This Sunday, 28 August 2011, there will be a Floral Bicycle Parade startarting at the Royal Festival Hall and progressing along the Southbank in Lambeth, SE1. Organised as part of the 60th anniversary celebration of the Festival of Britain, recreating an event held in 1951. Everyone is welcome to take part: bring along your bikes, buggies, prams, scooters or other items to be decorated from 2pm onwards for the decorating before the main parade departs at 4pm. Bike decoration stations, complete with flowers, ribbons and other decorative items, are operating on The High Street (Level 1 outside Royal Festival Hall) from 2pm till 4pm. The Floral Bicycle Parade starts at 4pm at the Southbank Centre Square doors to Royal Festival Hall. Transport for London hire bikes are available at various points along the Southbank which is of course open to all considerate cyclists! TFL's Community Safety, Enforcement and Policing Team will also be available to offer security marking for your bike and offer advice on cycling. Our next architecture ride takes place on Saturday 20 August 2011 and will be looking at London's open air lidos. We will be starting with Lambeth's very own lido in Brockwell Park and then we will ride to Tooting Bec Lido, built by unemployed men in 1906 and probably the largest outdoor pool in Europe. We ride up the lively River Wandle as far as King George's Park, site of the now redeveloped Wandsworth Bathing Pool. Into Clapham Junction for a direct train to Gospel Oak and Parliament Hill Lido at the south end of Hampstead Heath. Built in 1938, this was the most expensive of the London County Council pools of the period and is now the sleekest, its stainless steel lining reflecting the sun. Bring a costume! Also nearby: Highgate Ponds - women's, men's and mixed - Kenwood House and its Brew House cafe. Meet 10:45 at Brockwell Lido, Dulwich Road, London, SE24 0PA (in car park) for 11:00 start. Congratulations to Lambeth Cyclists Borough Coordinator Philip Loy on his marriage to Teresa McCrone on Saturday 13 August 2011. Appropriately they tied the knot at one of Lambeth's best known buildings - the National Theatre on the Southbank, Lambeth SE1 before proceeding along the Southbank to the reception at the Museum of Garden History building also in Lambeth SE1. 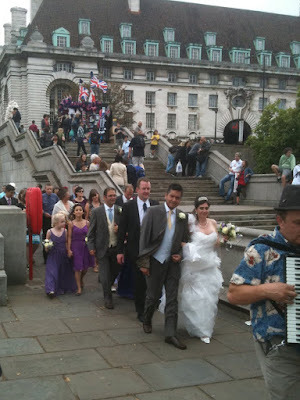 Photo shows Philip and Teresa leading the procession along the Southbank, Lambeth SE1. 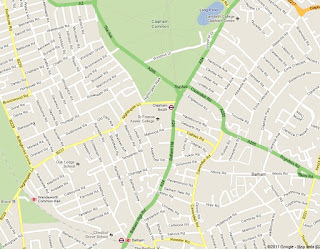 We are sad to report the death of a cyclist following a collision with a van on Cavendish Road on the Clapham/ Balham border, Lambeth SW12. Cyclist Johannah Bailey was killed after being hit on the morning of Sunday 31 July. Following the death we and LCC central stated our concerns over this junction to London Assembly Members Valerie Shawcross and Caroline Pidgeon, amongst others, at a site visit. 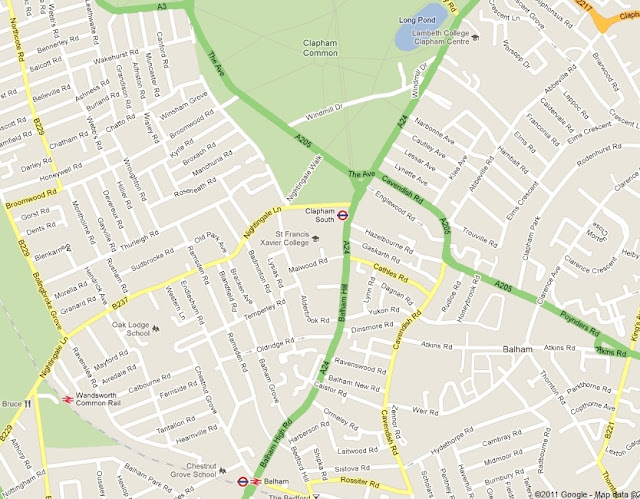 We highlighted to TfL the fact that cyclists had to cross multiple lanes of traffic when coming from the South Circular and that the off road cycle facility is not effective: using it requires cyclists to wait at three sets of traffic lights which means that many cyclists do not use it. We recommended that TfL undertake work to improve the facility and reduce the danger to cyclists at this junction. Sign up now for Lambeth Cyclists cycle maintenance classes! "Simon is a fantastic, patient teacher who makes sure everyone "gets it". I found the course to be great value, having paid for itself several times over in savings on shop servicing. Couldn't recommend it enough." 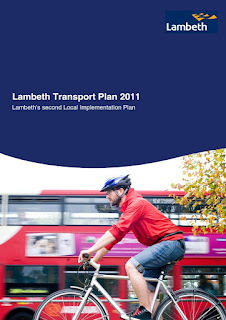 The 2011 Lambeth Transport Plan has been published setting out the borough’s transport priorities for the next 20 years. The plan, often referred to as a Local Implementation Plan or LIP, is a response to the Loindon-wide Mayor of London’s Transport Plan setting out how the strategic policies will be implemented locally. Lambeth have pledged to encourage more cycling and other forms of sustainable transport and reduce the real and perceived danger on Lambeth’s roads. The council is proposing a new ‘Neighbourhood Enhancemoent Programme’ approach which will work to ensure that ‘hard’ engineering measures such as traffic humps are complemented by softer measures such as planting trees, establishing cycle parking and making the area more pedestrian friendly. We are pleased to see that cycling and sustainable transport has been given priority in the plan. 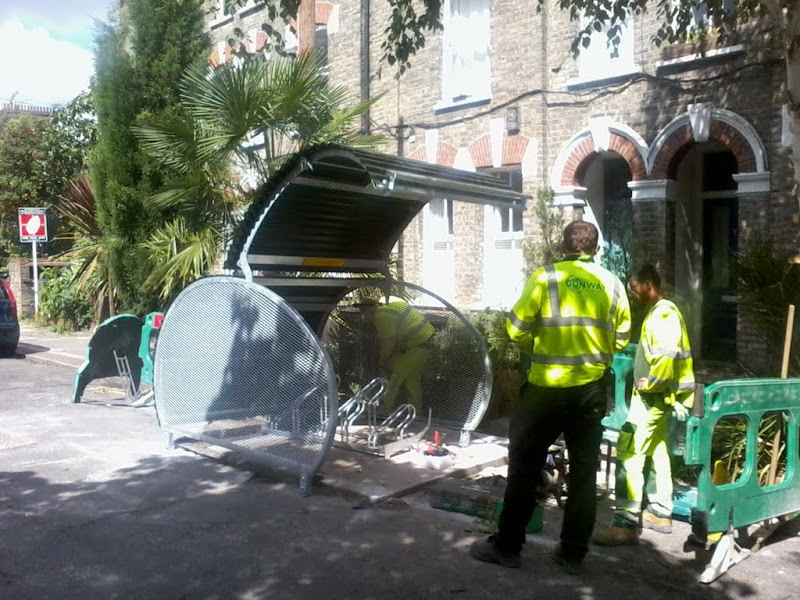 At the end of July the first of, its is hoped many, new cycle parking facilities was installed in Bonnington Sqaure in Vauxhall. The new Fietshangar provides secure parking for five bikes and takes up about half the space of a car parking place. The new facility has been installed following discussions between local residents and the Council. It is a shared initiative with Lambeth responsible for installation but residents responsible for its upkeep and allocation of spaces.